BMW's M division makes some pretty amazing vehicles, and they do make some questionable ones too. Cars like the M3 and M5 are consistently lauded for their incredible performance while vehicles like the X5M and X6M make people scratch their heads and wonder "why?" In all the years the M division has been creating monster machines though, BMW has never taken it upon themselves to create a super version of the full-sized 7-series sedan. As it stands right now, Mercedes Benz and their S63 (soon to be S65) AMG, and Audi's S8 have no competition from BMW. While you could compare the S63 AMG and Audi S8 to vehicles from Rolls Royce and Bentley, would it not be more interesting if t were the German big three slugging it out? "But guys, there's the Alpina B7!" Yes, the Alpina B7 could be considered BMW's super luxury barge, but it is not built by BMW or its M division, but rather by Alpina (a separate company that builds their own cars based off of BMW's vehicles). Enter the BMW M7. This would be BMW's super luxury barge built by their own in-house tuning arm to take on the Mercedes S63 AMG. While the car does not actually exist, and is questionable whether it ever will, its non-existence allows us to imagine what the car would be like. BMW claims there is no market for such a car, and that buyers wanting a performance version of the 7-series would just buy the V12 equipped 760Li. We believe the Mercedes S63 AMG and Audi S8 prove otherwise. BMW believes that anyone wanting a performance version of the 7-series would just get the V12 equipped 760Li. Here is my problem with that thinking: the "L" in the model name means it is the long wheelbase version of the vehicle. Unfortunately, the V12 equipped version of the 7-series only comes in the long wheelbase version. What about buyers that want the thrust of the V12, but the smaller dimensions of the regular wheelbase 7-series? Also, what if said potential buyer wants something more performance oriented than the 760Li's V12? Why not drop the M5/M6's twin-turbocharged, 4.4 liter V8 into the 7-series and strap it to an all-wheel drive system? Both the Mercedes S63 and the Audi S8 only come in all-wheel drive flavor, so BMW could just as easily do the same. Mated to the M5/M6's 7-speed twin clutch transmission, you have got a serious heavy weight performer on hand. With straight-line performance sorted, we can now look at handling. Since the 7-series is a very heavy luxury sedan, you are going to need a suspension set up that can shuffle the weight around while still offering comfort in the mix. Along with the M division tuned suspension and chassis, all M cars come with the M Dynamic Damper Control and M Driving Dynamics Control. In order to give the M7 its "luxury barge on steroids" status but still maintain comfort, I would hope the M Division engineers will give the car a "comfort" mode along with the standard "sport" and "M" modes. Adaptive dampers alone won't be enough, however, so air springs must be added to the package to allow for not only superb comfort, but also adjustability, the hallmark of any luxury car these days. Some very sticky tires wrapping around what will most likely be 20 inch wheels will also help with the handling. Due to the weight of the M7, I would hope that the car would come standard with six piston calipers on the front, four piston calipers on the rear, and huge discs on all four corners. The M7 has to look the part of an M car as well. The standard suite of cosmetic upgrades given to M cars, including all the carbon fiber roof panel, badges, exclusive wheels, aggressive bumpers, etc., should appear on the outside of the car, which should gain access to the Estoril Blue that is unique to M cars. Out back, a set of quad exhaust pipes that bellow with every touch of the accelerator should go without saying. The interior of the car should have all the M exclusive bits too, like an M exclusive steering wheel and seats along with a standard head-up display. At the same time though, the car should still offer the creature comforts one expects from a modern luxury barge, like heated and vented seats that also have a massage feature. Rear seat passengers should still be swaddled in luxury and have their own climate controls as well as window sun-shades. Most importantly of all, carbon fiber trim should find itself used in as many situations as appropriate since shedding even a little weight would help. 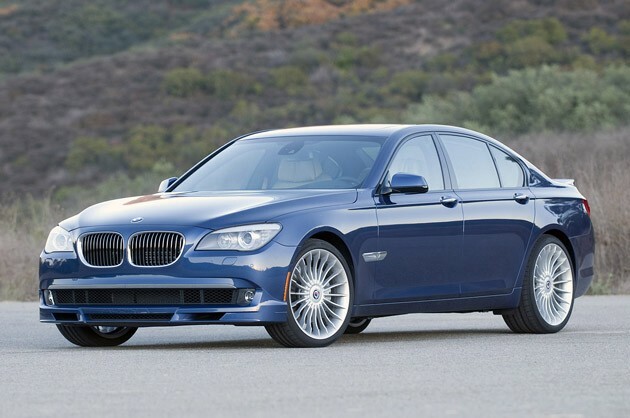 When you look at an M7, it should ooze speed and aggression, not the standard 7-series' look of big corporate luxury. Getting in to the car should make you want to drive it. This should be a car that has such a menacing stance that people move out of its way, much like the Mercedes S63 and Audi S8. With the above mentioned engine, suspension tuning, and interior and exterior improvements, BMW would truly have a super luxury sport sedan on its hands. Clearly they are not a brand afraid to produce cars that sell in limited quantities, so perhaps if enough people express interest, they will reconsider and finally introduce a true M7.